The ancient method of growing vegetables in hot beds, used by the Victorians and by the Romans, harnesses the natural process of decay to cultivate out-of-season crops. Jack First has revived and modernised this remarkable technique, and produces healthy vegetables at least two months earlier than conventionally grown crops. This practical, illustrated guide has everything you need to understand how to use this highly productive, low-cost, year-round, eco-friendly gardening system. Straightforward explanations and diagrams show how you too can grow early veg without fossil-fuel energy or elaborate equipment. With just stable manure (or alternatives), a simple frame and a small space to build your bed, you can be harvesting salads in March and potatoes in early April. Jack First's hot beds were featured on BBC TV's Gardeners' World in 2012. The episode won first prize in the Garden Media Guild's best Garden Feature TV Broadcast of the Year awards. You can watch it here. “Jack First’s small but perfectly formed volume on Hot Beds is going to save me a lot of time… a very detailed guide… If you’re unfamiliar with this once widely used technique then Jack First is the man to tell you about it. Charles Dowding has read this book and is experimenting with the technique on his new farm. That's got to be the highest recommendation anyone can have :)"
- Suma Wholefood Wholesalers Blog. Jack First is an experienced horticulturalist who has pioneered, developed and fully tested the hot-bed methods covered in this book. 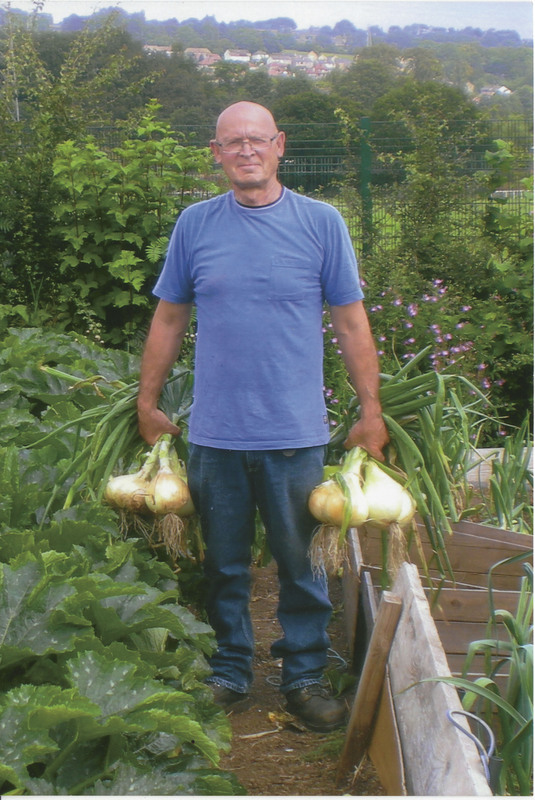 He works with volunteers on a large plot in Keighley and is the sole supplier to his local wholefood shop of out-of-season greens, new potatoes and salads. He studied agriculture in the late 1960s and has been involved with farming and horticulture ever since. For the last 14 years he has run a horticultural project for people with mental health problems. He was a Soil Association symbol holder for ten years, taught organic gardening at Shipley College, has given public talks to allotment associations and worked in schools setting up organic gardens. He also worked in a wholefood cooperative, producing, wholesaling and retailing organic produce. While at college, Jack came across an old gardening book that included a passage on hot beds. He has since amassed many old books on the subject, inspired to try out this intriguing growing method himself. How did they do it? Did they really attain those incredible early yields, and could those old methods be replicated? Taking up that challenge has resulted in Jack’s book Hot Beds. Jack First’s hot beds have been featured on BBC TV's Gardeners’ World. The film the BBC made with Joe Swift and Jack First for that episode won first prize in the 2012 Garden Media Guild Awards for Garden Feature TV Broadcast of the Year. It shows clearly how to build a hot bed. You can watch it here. Jack First is married with three sons and lives in West Yorkshire.